Danny Buteau returns to pace Oak Hill. Two area wrestlers will chase a fourth individual state title this season. Oak Hill senior Danny Buteau and Skowhegan senior Cody Craig will each try to join the short list of Maine wrestlers who’ve accomplished the feat. Furthermore, Craig will lead a Skowhegan team that is coming off a spectacular season that culminated with the Class A state title. The Indians should be in the hunt again, although graduation took its toll on the team. Craig’s career has been nothing short of spectacular — he’s never lost in the state of Maine and has two All-American finishes at the USA Wrestling national championships to his credit. He knows what he wants to accomplish in his final season. Craig starts the season with a 158-0 career in-state record. His overall record, including New England tournament performances, is 164-5. He narrowly missed claiming a New England title last season, falling just short in the championship finals. All his state titles have come in the 106-pound weight class. He is uncertain about where he will be at the end of this season. Buteau had won two state crowns at 106 pounds while Oak Hill was in Class C. Last season, Oak Hill moved to Class B in which Buteau won his third state title, this time in the 120-pound class. This season he plans to compete at 132. Buteau’s current career in-state record is 133-9. Skowhegan lost several standout wrestlers from last season’s team that also won Kennebec Valley Athletic Conference and Class A North titles. State champions Julian Sirois and Kameron Doucette and place-winners Logan Stevens and Luke Bolster have moved on. Still, the Indians have a solid core of talent returning. Junior Samson Sirois reached the finals and junior Jon Bell placed fourth. Rick Oberg, Daniel Laweryson and Caleb Vautier were state qualifiers last season. Although Skowhegan appears to be poised to maintain its hold on the region, coach Tenney Noyes knows much work has to be done. Nokomis finished fourth at Class A states last season — its best finish in program history. Christopher Wilson won his weight class and also finished third at New Englands, the highest finish ever by a Nokomis wrestler. Wilson was just a junior, but chose to graduate early in order to join the Coast Guard. Teammate Hunter Glidden won the 285-pound class and has also graduated. The Warriors return two state place-winners in Quinton Richards and Joshua Brown. 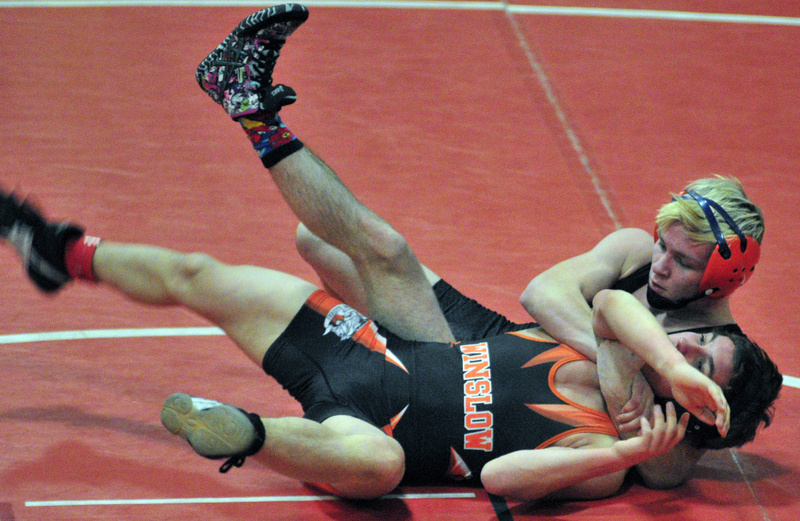 Richards reached the state finals at 138 pounds in just his freshman year. Brown, a junior this season, was third at 106 but is expected to compete at 120 this season. Cony returns five wrestlers from a squad that won 22 dual meets and finished runner-up at the A North regionals. Sophomore Noah Dumas was a KVAC champion and regional finalist at 106 pounds last season and is slated to compete at that weight class again this season. Joining Dumas at the state meet were Jacob Arbour, Nic Mills, Nick Sidelinger and Mitchell MacFarland. Arbour placed fourth. Winslow had a strong tournament team last season, finishing fourth in Class B. The Black Raiders return all scorers from that squad except Nat Beckwith, who was second at 220-pounds. Junior Ryan Fredette is a two-time state champion and is expected to compete at 182 this season. Devon Vigue and Patrick Hopkins each were second last season. Ben Abbott was third at 160, but the lanky senior will compete at 195 pounds this season. Jake Peavey was a runner-up at states last season for Erskine. The junior heavyweight, whom coach Patrick Vigue describes as “big, strong, and quick,” spent a good deal of time in the offseason competing in open tournaments. “I went to tournaments in New York, Massachusetts and New Hampshire, as well as a couple in Maine during the summer,” said Peavey. Erskine won 19 dual meets last season and finished fourth in B South. Michael Sprague, a junior who finished fourth in the state, returns at 120 pounds. Monmouth’s Calvin Thompson looks to complete his career on a winning note. The senior was a state champion in Class C as a sophomore, but lost to Buteau in last the 120-pound class at the Class B finals last season. Madison returns two state place winners in senior Matt Brown and sophomore Dawson Senter. Maine Central Institute junior ZyAnthony Moss was a regional champion at 120 pounds and also finished third in Class B last season in that class. Junior Austin Pelletier competes as a Messalonskee independent attached to Skowhegan. Pelletier finished fourth in Class A at 152 last season. Gardiner’s Cam Bell is his squad’s lone wrestler with state tournament experience. The senior placed fourth last season in Class A South. Mt. Blue had one state qualifier last season in senior Austin Seeley at 220 pounds. Mount View, which is in the middle of a rebuilding campaign, will look to Sierra Fonger for senior leadership.